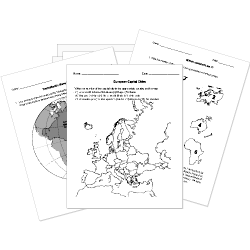 You can create printable tests and worksheets from these Grade 8 Bodies of Water and Continents questions! Select one or more questions using the checkboxes above each question. Then click the add selected questions to a test button before moving to another page. Which of the following lists all of the continents? A narrow body of water that connects 2 larger bodies of water. Asia is surrounded by the Atlantic Ocean. The Continental Divide is a stretch of high land that lets water from the rain drain into the major oceans and seas of the world. What body of water serves as a boundary between Europe and Asia. What 4 countries have some of their land in both Europe and Asia?